this one was at the labor day show in henderson's lincoln dealership. 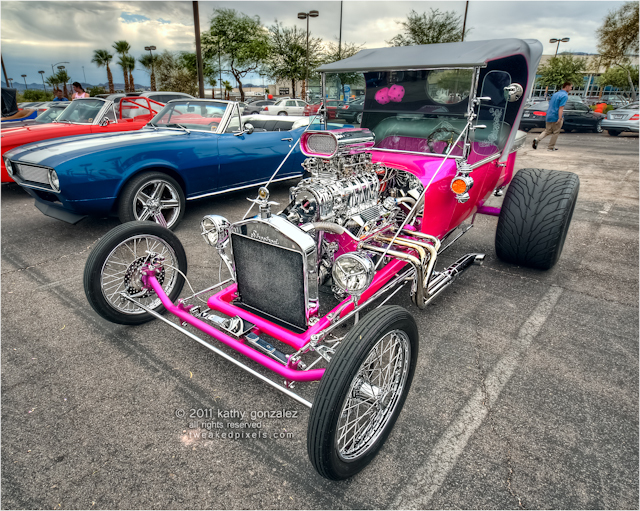 it stood out amongst all the chevys, rat rods, and other typical vintage stuff. mostly because it was hot pink. these puppies always make me think herman munster. so while i was taking a few shots of it, some old guy walks by and mumbles about it being a “girl car.” ya, i didn't shoot his car, so maybe he was jealous? even has hot pink dice...ya, it's a chick car.